The tides are looking great this week and there is minimal rain in the weather forecast therefore the Capilano river levels should remain low. There were a lot of coho in the Cable pool last week in the range of 8-9 pounds which is bigger than your average size for this time of year so hopefully they will accumulate in the estuary for the rest of the summer if we don’t get any heavy rains. There is fish in the estuary already but you have to be patient and wait for them to show, don’t rely on jumpers so much as these fish can be a fresh school, look for any disturbance on the surface and then cast you lure to the pod. Cast ahead of the pod and bring you lure into them and look to see which direction they are swimming and cast well in front of them. I will be teaching the last fly fishing of the beach” course this Monday so if you are new to this fishery or have any unanswered questions I can hopefully help you. 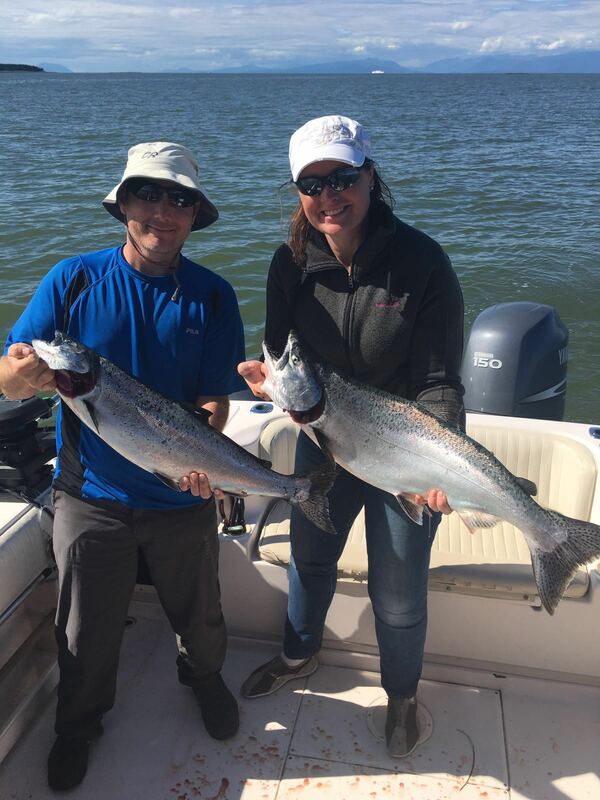 In general the fishing was pretty tough this past week for coho and chinook. The coho are around but they seem to be getting a pass with the recent rains and heading right up the river. The Capilano River is full of nice size coho, some of them up to 8 pounds, above average size for this time of year. There is 1 day of rain forecast for Monday and then it looks like the rest of the month is forecast to be hot and sunny. This should keep the river low and cause more coho to sit off West Van so we should see a marked improvement in the coho fishing in the back end of July. Check out last week’s fishing report for specific details on what flashers and hootchies to use for the coho. The chinook fishing off the Bell Buoy has also been pretty spotty as well. I think this will pick up this week as there are definitely some more fish starting to show up in the test sets on the Fraser River. This is pretty standard for the back end of July, more coho show up, the Cap gets low so they stack up, and more chinook show up. So fingers crossed, but I think we have gotten through the slow part of early July and the fishing should really pick up in the back half of the month. 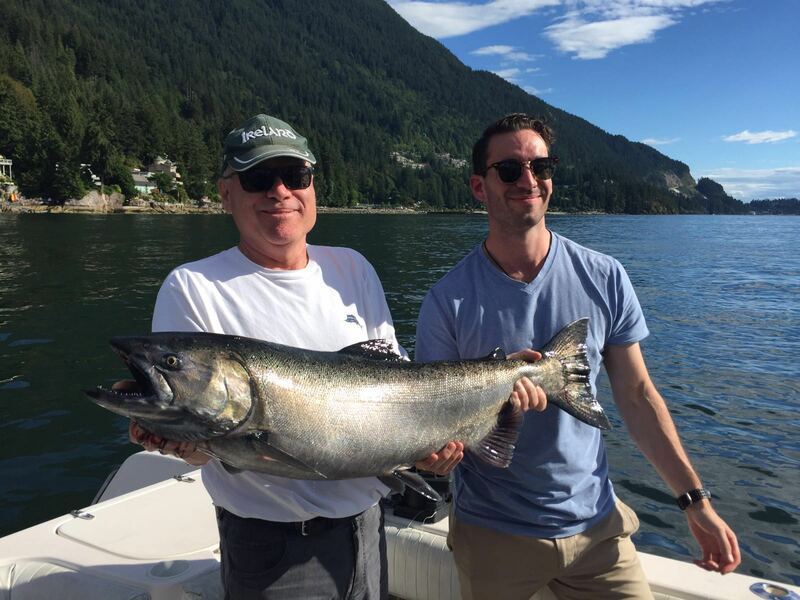 John with a nice size hatchery coho for mid July caught on one of our charters to Gabriola and Nanaimo. 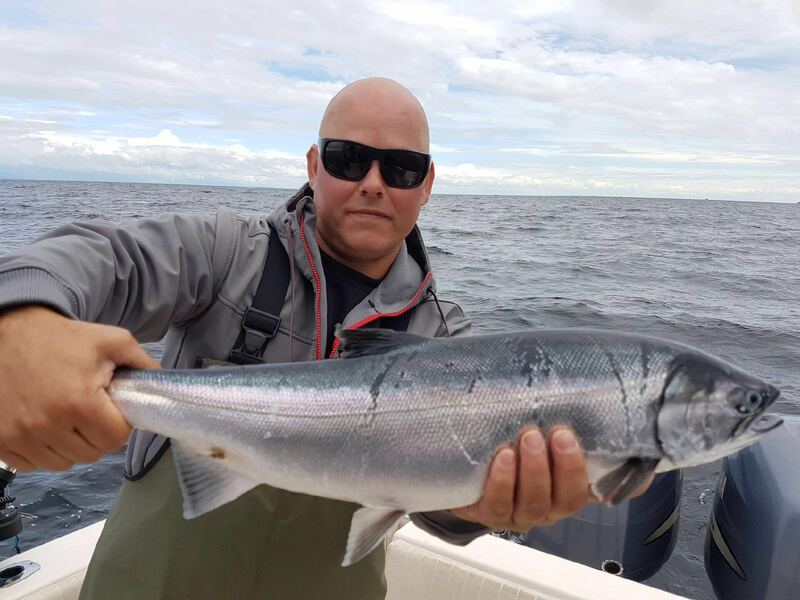 Over on the other side of the pond, aka Gabriola and Nanaimo, we are seeing good numbers of hatchery and wild coho and some chinook as well. The coho seem to be down about 75 to 150 on the downriggers and the chinook are hitting the bait right on the bottom in 180 to 200 feet of water. 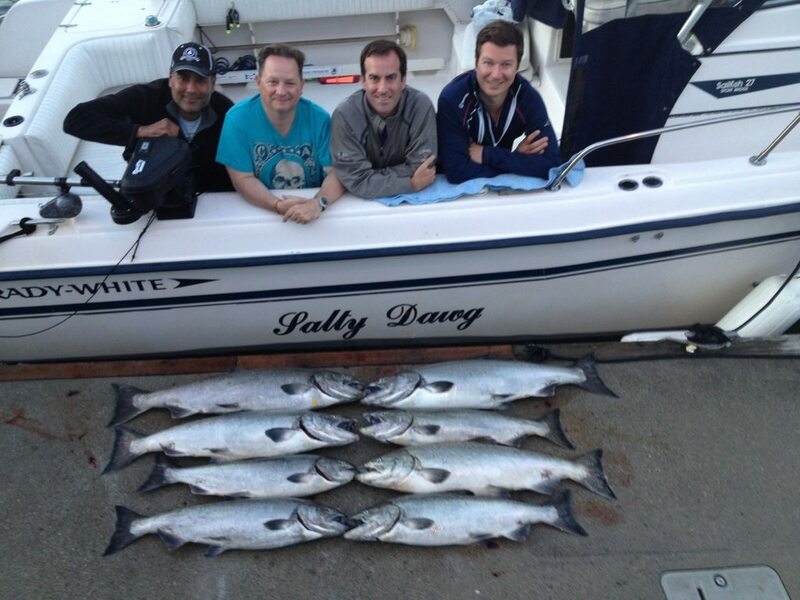 The same flashers and hootchies we use for the coho off West Van are productive in this area as well. For the chinook we have been doing well with the Oki Double Glow flasher and glow hootchies and glow spoons. Some of the standout hootchies have been just straight glow and glow with a splatter back. Productive spoons have been Pesca 3.5 and 4.0 sizes in Gut Bomb and Sucker Punch. If you want to get some chinook like the ones pictured here, be prepared to fish deep. These fish were caught using 18 pound cannonballs and fishing 200-240 on the riggers. Frederic and Shivauna holding up a couple of nice chinooks from Sunday’s trip. Up in Howe Sound things have been relatively quiet. There has been the odd big Squamish chinook caught around Hole in the Wall but for the most part it has been slow. As mentioned in previous reports, if you do get one it is usually a good size and worth the wait. A nice size Hole in the Wall chinook from one of our afternoon charters this week! So although it has been a slow week, you can see we are still getting some fish. I know the guides are eagerly awaiting the arrival of some more coho and chinook and we excited about what next week has to offer.